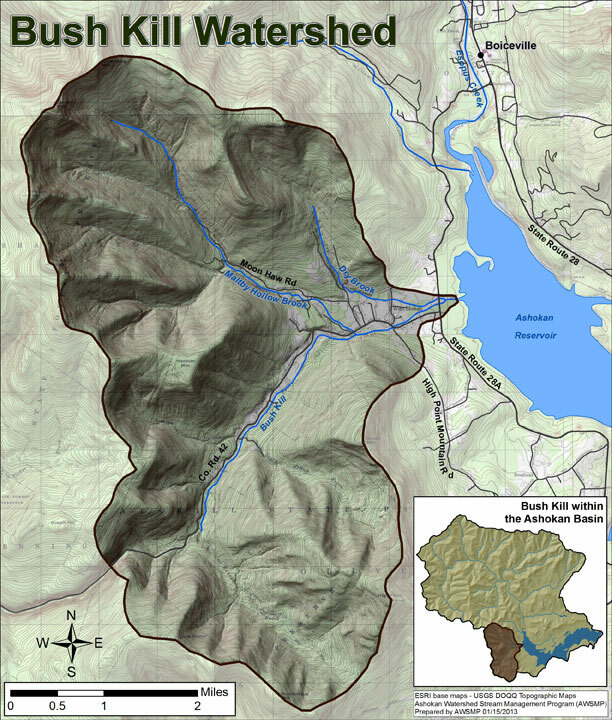 Located almost entirely in the Town of Olive, the Bush Kill is one of the few streams in our area that drains directly into the Ashokan Reser­voir. The Bush Kill begins in the unde­vel­oped Sun­down Wilder­ness Area and its head­wa­ters drain sev­eral nearby moun­tains includ­ing: Ashokan High Point, Mom­bac­cus, Lit­tle Rocky, and Hanover Moun­tains. 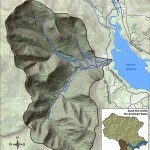 The Bush Kill water­shed is 19.6 square miles. 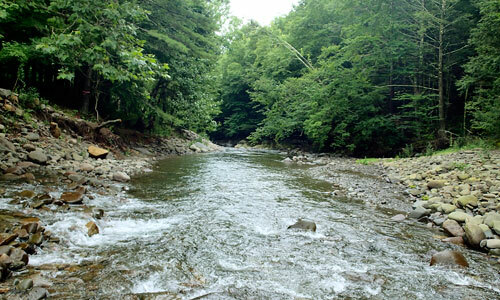 The Bush Kill main­stem flows 7.6 miles north. The Bush Kill is joined by sev­eral trib­u­taries includ­ing Kanape Brook, South Hol­low Brook, Mine Hol­low, Maltby Hol­low Brook, and Dry Brook. The stream is par­al­leled by Ulster County Route 42 for much of its length before end­ing in West Shokan, where it flows into the Ashokan Reservoir. In 2012, Ulster County Soil & Water Con­ser­va­tion Dis­trict tech­ni­cians, with assis­tance from interns from the Stu­dent Con­ser­va­tion Asso­ci­a­tion and Ulster County Com­mu­nity Col­lege, did a stream assess­ment along the Bush Kill. The assess­ment focused on the area along County Route 42 from Kanape Brook down­stream to the reser­voir. Dur­ing the walkover, the team inven­to­ried ero­sion haz­ards, sus­pended sed­i­ment sources, woody debris haz­ards, and cul­verts. While roughly 98% of the water­shed is forested, the major impair­ments for the creek are related to devel­op­ment in the val­ley bot­tom. Obser­va­tions made dur­ing the assess­ment sug­gest that the stream’s inter­ac­tion with trans­porta­tion infra­struc­ture, includ­ing road embank­ments, cul­verts, and bridges in the tight val­ley place high stress on the creek’s mor­phol­ogy and water quality.